Been really delinquent with doing my tags! Sorry to everybody who've been so sweet enough to think of tagging me. I'm devoting this entire week to answering tags! 2. List how much it cost. And this is not to judge. This is for entertainment purposes only. So spill it. And if there is a story to go along with how you obtained it, we'd love to hear it. 3. List what's inside it and post a picture of the entire mess! 4. Tag some chicks. And link back to this post so people know why the heck you're showing everyone your bag. 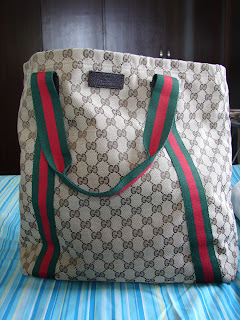 My Gucci Limited Edition Shoppers Bag! It's free. I won it in a recent Nuffnang contest and you'll find the exciting story here and the post that won the contest here. It's reportedly worth over GBP 300 (PHP 21,000) according to Shoewawa and Handbag.com! 1-2. shoe bag - I walk to work so I bring my heels in this pouch. 3. Alexa bag organizer - given to me by dear friend Maisa Deluria. This has soooo many pockets! It very efficiently contains the rest of my mess! 5. L'Oreal True Match mineral foundation powder - when they say it's a true match, they mean it! I have never used a foundation that's made me look flawless and natural until I met True Match! 6. The Body Shop foundation brush - I am soooo in love with this brush! My one problem with True Match is the awful brush, but with this uber soft and compact brush, that problem is solved. 7. Modelco eyebrow kit - since I decided that I wanted to look like Camilla Belle, this amazing kit has brought me more than a few steps closer to looking like a star! 18. our ridiculous office ID - it's for a creative environment, I know, but try showing that ID at embassies and banks. I always get, "Ma'am, do you have a real ID?" 19. Ventolin inhaler - I have asthma. I can leave anything and everything except this! 20-21. two Sony Ericsson phones - one for personal use, the other's SIM is owned by the company. They're both very battered and old but I can't bear to replace them! 23. a personalized pen - all my pens are personalized but this particular one was a lovely gift by my old friend Tatin Lopez. It came with a beautiful red Moleskine journal. So that's a total of 23 items! In the words of my husband, "Why on earth is this bag so heavy? And why--despite how huge and heavy this is--do you never have a nail cutter when I need one?" I reiterate that I only bring this much when I have a big event and I'd need to change outfits and put on makeup. 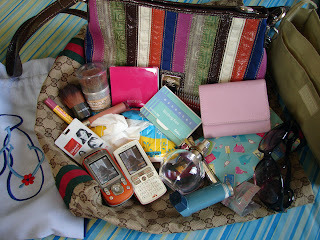 Most days, I just bring the small bag and its essential items! Wow, that's A LOT of stuff, Frances ☺ Your shoulder must be aching just from carrying your bag to work! I adore Body Shop products! Especially since it's an ethical company. Your smaller bag is cute! Wow. And I thought I was the only one who put a small bag inside a big bag so that the big bag can be left behind when possible but in the end, we were able to bring everything we need. And I always have a huge and heavy bag as well. People always wonder how I never seem to lose weight when carrying my bag is an exercise and itself. he would always ask me "why do you have to carry your huge white bag all the time?" you do carry lots of stuff! i love seeing what sort of things other gals carry in their bags. Hmm, methinks I have the same BodyShop brush, which I leave at home. Sigh... I feel compelled to respond to the tag - thing is, my bag is a huge mess! But I'd be honest, promise. You must let me know if/when you come to Bath, it's the city next to mine and I could easily pop along to meet you for a day if you'd like me to! Woah! Your bag is awesome! I love a big bag, you can always fit heaps of stuff in them <33 I shall do this tag tomorrow night! Hiya Duni, I just switch shoulders when the other one gets sore! And I don't carry this every day. I love Body Shop, too! I especially am a fan of the Dry Olive Oil Mist. Well, Kae, I don't have a big bag all the time! Just when I have an event which is maybe once a week! SavvyMode, you should do this tag, too! I want to know what savvy girls like you carry around! Ria, the Body Shop brushes are amazing! Belowen, ya, big bags are great! I have about 5 big bags! And sure, just do this tag. I'm curious to see what you have in your bag!